Spread the softened butter on one side of each slice of bread. Put two slices of cheese on the bread. After about 2-3 minutes it should be ready to flip. Slice the grilled cheese on a cutting board with one swift downward motion slice through the sandwich. Lookin’ mighty tasty!! I’m gonna try this one next time I go grocery shop for sure! Had this last night. Cook up some tomato soup (with milk, not water), then dunk your grilled cheese right in to soak up the soup. Delicious! Hi Leif, “Hearty” white bread refers to bread that has a firm texture, as opposed to a soft, squishy texture. I am actually told by many people that my videos are very helpful in learning English. Who would have guessed! Kevin – that combo takes me back to childhood! Jun, my neice adds parmesan cheese to the butter on the outside. It’s a wonderful addition! I’m a newbie cook (at age 46!). I found this site from the New York Times “Wellness” blog, which in turn had a pointer to Real Simple’s “best blogs” list. Phew! Glad I found you, though, because these videos are great. I made the grilled cheese sandwiches for my kids yesterday, and they came out perfectly; the “trick” with using the kitchen knife to slice was a stroke of genius! Thank you. I use mayo instead of butter/margerine. It keeps the bread from getting that soggy texture in the middle, never burns, and it’s always perfectly crispy. My brother thought I was crazy until I made him one and he now says that “his sister makes the best grilled cheese ever”. Welcome Lolanthe! I’m delight to hear how you discovered us! Be sure to let me know if you have any questions! Lisa that is so cool! I can’t wait to give mayo a try! Thanks Rone! Do you use the same cheese as what you put inside the sandwich? Hey Lisa, I tried your mayo trick and it works! It did taste a little different (in a good way) from a grilled cheese made with butter. The bread browned beautifully! After browning both sides, put some grated gruyère and very finely sliced mushrooms on top. Place the sandwich into a steam basket with paper towels in the bottom. I learned a simpler version of steaming grilled cheese from my daughter’s boyfriend. As the sandwich cooks, use your fingers to splash a little water in the frying pan and cover. My problem is that when I eat something greasy and go to sleep, I have indigestion and reflux. I discovered that when I steam the food abundantly inside a pressure cooker, I digest it very easily even when I am asleep… Of course sometimes the bread gets wet, but I prefer eating wet bread rather than being ill in the middle of the night. Mary and Rone, I have never actually heard of a steamed sandwich. Rone, Sorry about the digestion issues but I must say your Pressure Cooker sandwich sounds most unusual! 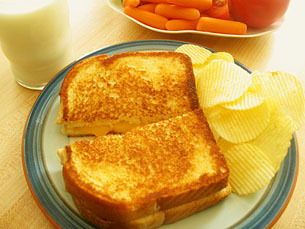 Than again, Lolanthe’s mayo grilled cheese was really delicious! I guess one should just keep an open mind to new suggestions! But, having said that, I do think I’ll stick to butter on hearty white bread with plastic wrapped cheese! I do recommend you try this with some delicious mature chedder, it’s slightly tangier and very moreish! Nothing better than a nice mature cheddar cheese! I just made a Grilled Cheese with crusty bread and added some grated Parmesan cheese to the butter and then spread it on the outside of the bread. Oh me, oh my was that tasty! Congratulations Melanie! Good luck developing your cooking skills. Learn how to make the perfect grilled cheese sandwich with this new startcooking recipe video. Bread, cheese and butter is all you will need to make this delicious sandwich. Enjoy!